Cyazofamid is a new fungicide discovered by ISK and firstly launched in 2001. Cyazofamid, with its novel mode of action, is highly effective against Oomycetes diseases. Cyazofamid has good persistence and offers excellent rainfastness in many crops at low dose rates but no negative impact on beneficial insects and mites. 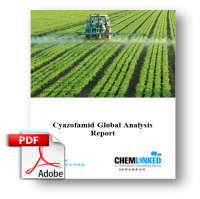 Cyazofamid shows excellent performance on Oomycete diseases such as late blight in potatoes, tomatoes, pepper, and other vegetables and downy mildew in grapevine, cucumber, melon and others.